This delightful troubadour has been singing up a storm in the basement. In 1688 the Italian scientist and poet Francisco Redi demonstrated that new life, flies to be precise, does not arise mysteriously from decaying meat, thereby helping to debunk the widely held notion of spontaneous generation. However, the mystical appearance of field crickets in my basement each autumn makes me wonder if Redi might have missed something. Where did these crickets come from and what are they doing there? One of the most common of our autumnal household visitors is the field cricket, Gryllus pennsylvanicus. 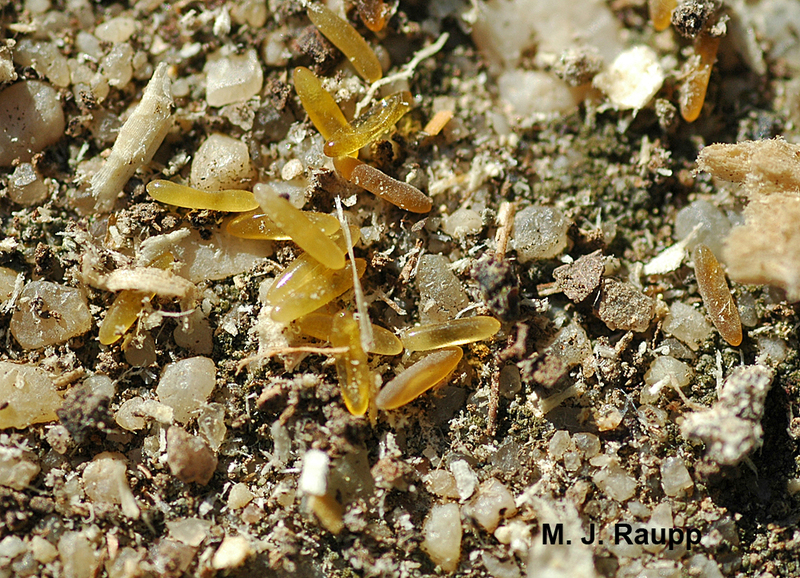 Cricket eggs develop in the soil after the female makes a deposit. The annual life story of the field cricket began in the spring when young crickets, called nymphs, emerged from eggs laid in the soil by the female cricket the previous fall. These eggs rested underground until May, when the youngsters hatched. The nymphs spend the spring and summer feeding on plants, decaying fruit, seeds, and, sometimes, other insects including their own kin. After molting eight or more times, the nymphs complete their development and become winged adults. The male field cricket has remarkable structures at the base of his forewings called the file and scraper. By rubbing the scraper of one wing against the file of the other, the characteristic chirping sound is produced. The male field cricket has several songs, one to warn other males to stay off his turf, one to attract a potential mate, and one to convince an interested babe that he should be the father of her nymphs. The female field cricket is fantastic in her own way. Not only will she select a mate on the basis of how well he sings, but she will also see how well he can dance, and dance he does. She hears his song with “eardrums” on her front legs. Now, that’s some kind of wonderful. When the scraper on one wing passes over the ridge-like veins on the other wing, it creates vibrations and produces the cricket’s chirp. For centuries Chinese gamblers have wagered high stakes on the outcome of cricket fights. An interesting trick used by the cricket handlers to resuscitate losers of bouts is to shake the defeated warriors and toss them in the air several times. This dramatically reduces the recovery time and allows the small combatants to return to the arena in minutes rather than the regular convalescent period of days. A recent study published in Nature confirmed the success of this therapy in helping defeated crickets regain their fighting spirit. This gal contemplates the message in a suitor’s song. In addition to the fight songs, what useful information is carried in the male cricket’s vocalizations other than the typical male plea for female attention? A fascinating study by two Finnish scientists of the Mediterranean field cricket, Gryllus bimaculatus, found a link between the male cricket’s song and his immune response. Troubadours with a highly attractive song also had superior immune systems. If the ability to ward off diseases due to superior immune function can be passed along to progeny, then females that choose a mate with an enhanced immune system may ensure better survival of their offspring. By demonstrating his superior immune system with a song, the male cricket may win the lady. Wings up, a male cricket prepares to give the current temperature outdoors. One last thought about the cricket and his song, relates to Old Man Winter, who is just around the corner. As you know, insects are cold blooded. This means that the body temperature of an insect is more or less the same as the environment that surrounds it, unless it is basking in the sun or using muscles to elevate its temperature. The frequency of chirping varies according to the temperature. To get a rough estimate of the temperature in degrees Fahrenheit, count the number of chirps in 15 seconds and then add 37. The number you get will be an approximation of the outside temperature. During the steamy days of August, field crickets are commonly found in woodpiles, garden vegetation, and tool sheds outdoors. However, as the weather begins to cool, these stealthy intruders may enter homes under door sweeps, through spaces around basement doors and windows, and via openings in the foundation where dryer vents, wires, or pipes pass though. To prevent field crickets and other unwanted guests, such as the multicolored Asian lady beetle and brown marmorated stink bugs, from entering, keep doors and windows in good repair and use caulk or foam to seal openings to the outside. Also, do not keep cricket refuges such as firewood, lumber, or beds of ivy near the house. If you are fortunate enough to have one of these six-leggers arrive for a visit, sit back, relax and enjoy the serenade. Somewhere in your basement an ever-hopeful troubadour is putting on the performance of his life. In addition to wooing mates, some cricket chirps warn interlopers to get lost. The following articles were used to prepare this episode: “Courtship song and immune function in the field cricket Gryllus bimaculatus” by Markus Rantala and Raine Kortet; “Aggressiveness recovers much faster in male crickets forced to fly after a defeat” by Hans A. Hofmann and Paul A. Stevenson; and “Seasonal and daily chirping cycles in the northern spring and fall field crickets Gryllus veletis and Gryllus pennsylvanicus” by Richard Alexander and Gerald Meral.